From the artist 1906 to (Ambroise Vollard [1867-1939], Paris); sold December 1918 through Walter Pach and (Carroll Galleries, New York) to John Quinn [1870-1924], New York; his estate; probably from which purchased by (Paul Guillaume [1891-1934], Paris); sold 1927 to (Alex Reid & Lefèvre, Glasgow and London); sold 1931 to (Galerie Etienne Bignou, Paris); sold 1932 to G. Keller, Paris for (M. Knoedler and Co., London, New York and Paris). Acquired in Paris between 1932 and 1938 by Mme. Kaethe Perls, Paris; possibly by whom sold to Walter P. Chrysler, Jr., New York, Warrenton and Richmond, VA, who owned the painting by 1939; (Chrysler sale, part II, Parke-Bernet Galleries, New York, 16 February 1950, no. 54); (Julius H. Weitzner [1896-1986], London); sold 12 April 1950 to John Hay Whitney [1904-1982], Manhasset, New York; deeded 1982 to the John Hay Whitney Charitable Trust, New York; gift 1982 to NGA. Receipt to Vollard from Derain dated 6 July 1906 in Vollard Archives, Documentation, Musée d'Orsay, Paris (microfilm reel III, copy in NGA curatorial files). Judith Zilczer, "The Noble Buyer:" John Quinn, Patron of the Avant-Garde, Washington, D.C., 1978: 155. Letter dated 27 July 1984 from Alex Reid & Lefevre, in NGA curatorial files, outlines ownership between Guillaume and Knoedler. This may be the painting which figured in Knoedler's 1933 exhibition of paintings from the Vollard Collection. According to handwritten note from Klaus Perls in response to letter dated 11 July 1984 from the National Gallery of Art, Perls' mother, Kaethe, acquired the painting in Paris between 1932-1938. Lent by Chrysler to the 1939 San Francisco exhibition. See letter dated 26 July 1984 from John Rewald, in NGA curatorial files. Receipt from Weitzner dated 12 April 1950 in NGA curatorial files. Possibly La Libre Esthétique, quatorzième exhibition, Brussels, 1907, no. 87-90, one of four views of London. La Toison d'or, Tretyakov Gallery, Moscow, 1908, no. 35-38, one of four view of London. Cent Ans de Peinture Française, Musée Municipal d'Amsterdam, 1928, no. 7, repro. An Exhibition of Paintings by André Derain, Cincinnati Art Museum, 1930-1931, no. 18, repro. Paintings from the Ambroise Vollard Collection, Knoedler Galleries, New York, 1933, no. 20, as London: Houses of Parliment. Selections from Five New York Private Collections, Museum of Modern Art, New York, 1951, unnumbered catalogue. Les Fauves, Museum of Modern Art, New York; Minneapolis Institute of Arts; San Francisco Museum of Art; The Art Gallery of Toronto, 1952-1953, no. 33. Pictures Collected by Yale Alumni, Yale University Art Gallery, New Haven, 1956, no. 128, repro. The John Hay Whitney Collection, The Tate Gallery, London, 1960-1961, no. 20, repro. The Impressionists in London, Hayward Gallery, London, 1973, no. 55, repro. The "Wild Beasts": Fauvism and Its Affinities, The Museum of Modern Art, New York; San Francisco Museum of Modern Art; Kimbell Art Museum, Fort Worth, 1976, no. 80, repro. Aspects of Twentieth-Century Art, National Gallery of Art, Washington, D.C., 1978-1979, no. 39, repro. The Long Island Collections. A Century of Art: 1880-1980. Nassau County Museum of Art, Roslyn, New York, 1982, p. 35, repro. The John Hay Whitney Collection, National Gallery of Art, Washington, D.C., 1983, no. 43, repro. Impressionist and Post-Impressionist Masterpieces from the National Gallery of Art, Washington, State Hermitage Museum, Leningrad; State Pushkin Museum of Fine Arts, Moscow, 1986, no. 10, repro. André Derain: Le peintre du "trouble modern", Musée d'Art Moderne de la Ville de Paris, Paris, 1994-1995, no. 45, repro. Fauves, Art Gallery of New South Wales, Sydney; National Gallery of Victoria, Melbourne, 1995-1996, no. 28, repro. André Derain, 1904-1912, Museu Picasso, Barcelona, 1997, no. 18, repro. Le Fauvisme ou "l'épreuve du feu": Éruption de la modernité en Europe, Musée d'Art moderne de la Ville de Paris, 1999-2000, no. 43, repro. Masterpieces from the National Gallery of Art, Washington, Kyoto Municipal Museum of Art; Tokyo Metropolitan Art Museum, 1999, no. 76, repro. Fauve Painting from the Permanent Collection, National Gallery of Art, Washington, D.C., 2004-2005, no cat. 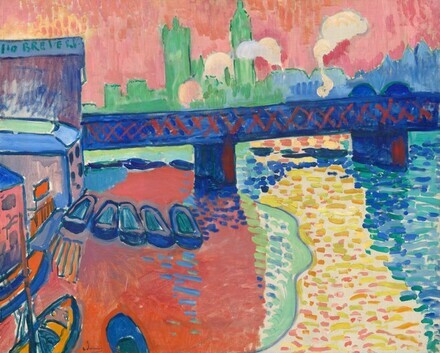 André Derain: The London Paintings, The Courtauld Institute Gallery, Courtauld Institute of Art, London, 2005-2006, no. 8, repro., as Hungerford Bridge at Charing Cross. Cezanne to Picasso: Ambroise Vollard, Patron of the Avant Garde, The Metropolitan Museum of Art, New York; The Art Institute of Chicago; Musée d'Orsay, Paris, 2006-2007, no. 76, repro. Wilenski, R.H. "Andre Derain: An Austere Romantic." Apollo 7 (1928):169-174, repro. Vaughan, Malcolm. Derain. New York, 1941: 37-42. Rewald, John. "French Paintings in the collection of Mr. and Mrs. John Hay Whitney." The Connoisseur 134, no. 552 (April 1956):138, repro. Walker, John. National Gallery of Art, Washington. Rev. ed. New York, 1984: 590, no. 909, color repro. European Paintings: An Illustrated Catalogue. National Gallery of Art, Washington, 1985: 128, repro. Kellermann, Michel. André Derain, Catalogue raisonné de l'oeuvre peint. Vol. 1, 1895-1914. Paris, 1992: no. 88, 56, repro., as Londres: Le Pont de Hungerford a Charring-Cross.